For TMJ/TMD Treatment please call our Little Rock office at (501) 225-1577. Neuromuscular Orthodontics is also known as NMO or Braces. Traditional orthodontics is retractive, or pulls the teeth and jaw backward towards the ears with headgear under the assumption that the jaw and muscles will adjust to the new position. The treatment objective is straightening the teeth for purely cosmetic reasons. When there is crowding or crooked teeth an orthodontist will often recommend extracting several teeth, most commonly bicuspids, in order to create room to align the remaining teeth. Making the teeth straight is the primary concern, so little to no regard is given to airway or the jaw joint. Receding lower jaws, those that are further back than the upper arch, are often treated with an invasive & irreversible surgical approach. This type of treatment often results in a narrow maxilla and mandible (upper and lower arch), airway restriction resulting in breathing difficulties, a high vaulted palate causing improper tongue posture and over compressed jaw joints. Poor functional habits such as mouth breathing, tongue thrust, improper tongue posture, abnormal swallowing patterns and clenching and grinding of the teeth are often overlooked resulting in a high probability of relapse and retreatment. Neuromuscular dentistry is a process that involves skilled dental professionals working with the muscles and nerves of the body to create maximum balance, comfort, and function. This area of dental expertise places emphasis on establishing and maintaining an anatomically ideal jaw joint position for each individual patient. Neuromuscular orthodontics, or orthopedic functional orthodontics, is based upon a practical approach. The purpose is not simply straightening the teeth but aligning them harmoniously with the muscles and temporomandibular joint (TMJ). Neuromuscular orthodontics often serves as Phase 2 of TMJ Therapy. Receding lower jaws are often symptomatic of TMD and craniofacial pain due to over-compression of the jaw joints; therefore, neuromuscular orthodontics is usually performed to align the teeth to retain (or hold) the newly acquired joint position after the patient has successfully completed TMD therapy, or Phase 1 treatment. Crowding and narrow, vaulted arches are treated with expansion appliances rather than the removal of healthy teeth and jaw surgery during Phase 2 of the treatment. These appliances in conjunction with bodily functions such as chewing, swallowing and proper tongue posture create wider dental arches that can accommodate all of the teeth by slowly transforming the underlying bone with the application of light pressure. The duration of this portion of the second phase of treatment is approximately 6 to 12 months and success directly correlates with compliance. The remaining portion of Phase 2 consists of moving your teeth permanently into the precisely measured orthotic position achieved with Phase I treatment using highly specialized dentofacial orthopedics, or braces. This portion of the treatment averages 18 to 24 months in duration with compliance. 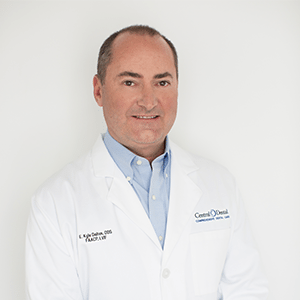 There are very few dentists in Arkansas trained and highly skilled in neuromuscular orthodontics; Central Dental is proud to be working with Dr. Dalton who has over twelve years of experience. Metal Braces – Metal braces are the most common and affordable type; they are made of a high surgical grade stainless steel. Colorful combinations of elastics may be selected and appeal to the younger age group. Self-Ligating Braces – Self-ligating braces also use brackets applied to the teeth and arch wires threaded through the brackets; however, instead of using ligature ties, or elastics, they use special clips built into the brackets to hold the archwire in place. They are often referred to as “speed braces” as manufacturers claim they reduce treatment time and the number of adjustment visits required. They tend to be easier to clean as there are no elastics to entrap plaque and food debris. Many patients report they are more comfortable which is attributed to less resistance between the brackets and archwires. This is a preferable option for adults as adolescents and children find the colorful elastics to be more fun and expressive. Clear/Ceramic Braces – Ceramic braces are made of translucent, stain resistant material that is barely noticeable. They are most popular with our adult patients, due to their cosmetic appeal. Ceramic brackets are more fragile than metal brackets and the clear elastic ties can discolor between office visits. Patients must be highly compliant and able to resist food choices that may cause damage to the brackets or stain the elastics. Clear/Ceramic Self-Ligating Brackets – Ceramic self-ligating brackets are made of translucent, stain resistant material that have special clips built into the brackets to hold the archwire in place. They are the premium choice for responsible adolescent and adult patients who seek comfortable and discrete treatment with faster results. These brackets are often said to shorten treatment length by an average of six months with patient compliance. Clear Aligners – This system is comprised of a series of plastic trays, much like clear retainers, that fit snug over your teeth. Each tray is designed and sequenced to move the teeth progressively until they are in the desired position. Treatment is typically slower than other orthodontic options as the trays apply less force to the teeth and the trays are fully removable requiring a superior level of patient compliance and commitment. Clear aligners are not suitable for all patients. Central Dental strives to provide fast and efficient orthodontic treatment; however, this will not be done at the expense of the overall health and well-being of the patient. Often times treatment lengths are shortened by focusing on simply straightening the teeth without regard for the proper bite alignment or jaw position; this directly conflicts with Central Dental’s comprehensive treatment philosophy. TMJ and TMD patients that have successfully completed Phase I treatment are sometimes recommended neuromuscular dentistry to hold the newly acquired jaw position. This occurs most often when the patient is unable to wean from the appliance and neuromuscular orthodontics is not an option due to the condition of the teeth and/or missing teeth. Occasionally, the doctor may recommend a combination of neuromuscular orthodontics and neuromuscular dentistry to address and resolve your specific needs. Each case is unique and should be treated as such. Occlusal Adjustment – making careful modifications or changes to the chewing surface of the teeth. These adjustments are made gradually over several visits after careful preparation with K7 measurements and transcutaneous electrical nerve stimulation (TENS) therapy to ensure the musculature can handle the changes. This is occasionally an option for a patient with relatively healthy, natural teeth or very well constructed crowns and bridges. Fixed – a moderate to high monetary investment. Removable – a moderate monetary investment. Dentures – for those who are completely edentulous, or are missing all of their teeth. Partials – for those who are partially edentulous, or are missing some of their teeth. Semi-permanent, long-term appliance – a cost-sensitive approach for those who are financially unable to obtain the aforementioned treatments in the foreseeable future. This is often the least preferred option as it is not very aesthetically pleasing, or beautiful. This type of orthotic is made of a stronger, more durable material. Office visits to check the appliance and symptoms are required at doctor prescribed intervals in an attempt to prevent relapse. Continued wear of the Phase 1 appliance – a cost-sensitive approach for those who are financially unable obtain the aforementioned treatments but expect to do so in the near future. Office visits to check the appliance and symptoms are required at doctor prescribed intervals in an attempt to prevent relapse. Dr. Dalton has dedicated 30 years to the study and practice of dentistry and 20 years of practice in TMJ and dental sleep medicine. Dr. Dalton is the only dentist in the state of Arkansas who is triple board certified with the American Board of Craniofacial Pain (ABCP), American Board of Dental Sleep Medicine, and the American Board of Craniofacial Dental Sleep Medicine. If you’re interested in neuromuscular orthodontics (braces) in Little Rock, Conway, or Central Arkansas, Central Dental can provide you with treatment options that will achieve beautiful yet functional results. Our doctors and team members will work with you to provide a customized treatment plan that will create the amazing smile you’ve been looking for. Please give us a call at (501) 225-1577 to schedule a consultation or send us a message below! What symptoms of TMJ have you been experiencing?